If you are looking for that perfect way to say “I love you” this Valentine’s Day, plan a romantic getaway to Eureka Springs! Tucked into the beautiful Ozark Mountains, this 19th century town is as romantic as it gets. The charming streets of Eureka Springs are lined with historic hotels, colorful Victorian Inns and unique Bed and Breakfasts. Here are five great ideas to celebrate Valentine’s Day in 2018. Eureka Springs is home to many great Bed and Breakfasts such as Angel at Rose Hall (photo right). From personalized attention to delicious food, there are many reasons to choose a bed and breakfast. For more information, view a complete list of Eureka Springs Bed & Breakfasts. Eureka Springs has been known as a spa town for over a century. The natural mineral springs in Eureka Springs have been drawing health enthusiasts from around the country. Because of this, Eureka Springs is a thriving spa town. Enjoy a Couples Massage at one of Eureka Springs’ Spas. In the Crescent Hotel, the New Moon Spa features some great spa specials for body wraps, scrubs, massage and more. The greater Eureka Springs area is home to many romantic mountain cabins. What better way to celebrate your love than snuggled up before a roaring fire with breathtaking winter views of the Ozark mountains. Sugar Ridge Resort (photo right) offers all of this and more. Browse a listing of Cabins and Cottages near Beaver Lake and Table Rock Lake in Holiday Island. Downtown Eureka Springs is filled with unique boutiques and shops carrying everything from bath products and fragrances, to handmade quality jewelry, art and antiques. You are sure to find a unique piece that you will cherish for years to come. Discover more about Eureka Springs Historic and FUN Downtown. Eureka Springs is home to some of the finest restaurants in Arkansas. The formal fare at the Crescent Hotel’s Crystal Dining Room (photo right) is sure to impress any date. No matter what your taste preference, Eureka Springs has it all! 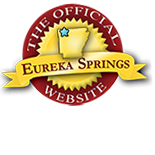 Discover more events in Eureka Springs Official Eureka Springs Calendar of Events. This entry was posted on January 5, 2018 by service424 in Crescent Hotel, Culinary Adventures, Eureka Springs Lodging, New Moon Spa, Shopping, Spa, Things to Do, Weekday Getaway and tagged beaver lake, Crescent Hotel, Crystal Dining Room, Eureka Springs, New Moon Spa, Spas, Sugar Ridge Resort, Valentines day.